This is a lovely, fresh and fast dish with many similarities to a traditional carbonara, in that the beaten egg creates the sauce by cooking with the heat of the cooked pasta. 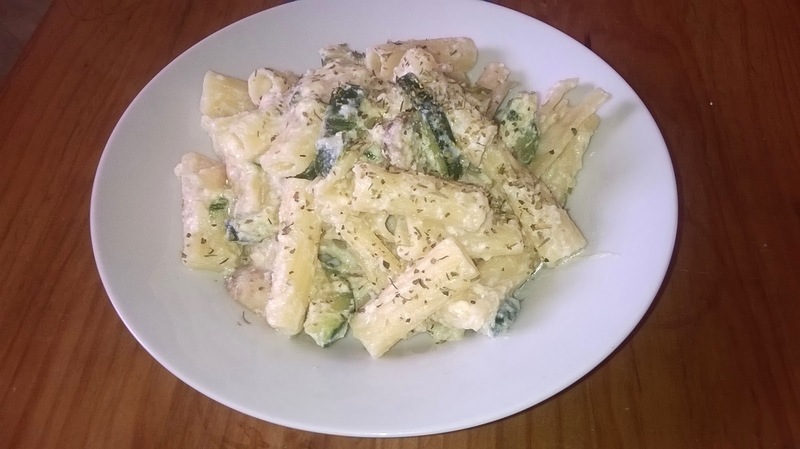 I’ve used this mouth-wateringly simple recipe by the master of Italian cooking, Antonio Carluccio, as inspiration for this dish. I’ve simply omitted the ceps (to decrease the cooking time even further!) and added courgettes (because I love them). I also drizzled a little truffle oil over our portions; it was a gift from the in-laws and it really gave our evening meal a touch of luxury. This one might not be much to look at, but trust me – it’s so handy to know how to cook and very, very tasty! This will take 15 minutes and serve at least 4. 1. Put the tortiglioni on to cook in a large pan of boiling water with a generous pinch of salt. 2. Meanwhile, chop the button mushrooms (into halves or thirds is perfect) and put into a large casserole dish with the olive oil. Put the heat on medium and cook for a minute. 3. Halve then quarter the courgettes lengthways, then slice thinly. Add to the casserole dish with 50ml water and put the lid on. Cook down for 5 minutes. 4. Stir in the grated parmesan and the ricotta. Beat the eggs and add them too – stir quickly and fold in the cooked pasta. When the sauce starts to thicken, the eggs will be cooked.